Receiving a scoliosis diagnosis is both frightening and confusing. Our natural first response is to search the Internet or consult various health practitioners. Due to the overwhelming available information on the Internet, different approaches and varying opinions, this can lead to more confusion. Human nature will cause us to respond to a diagnosis in two ways: 1) a “wait and see” approach and hope for the best or, 2) I want to do everything I possibly can to improve this. Our office believes in a safe, active and scientific approach to dealing with scoliosis. A non-surgical approach is the utilization of a scoliosis back brace. There are different types of braces for scoliosis, the traditional form is a rigid brace. As the name implies, the brace is made of a hard plastic that mimics a cast to stop or slow the progression of the scoliosis. These rigid braces for scoliosis use various names such as: Milwaukee Brace, Jewett brace, TLSO (Boston brace) and many more. A rigid back brace for scoliosis utilized as a potential road block to stop progression, however, the consequence is a restriction of movement and a weakening of the muscles. Unfortunately, research states that over 60% of patients using rigid scoliosis bracing are lost to surgery within 2 years. Contrastly, 58% fewer patients were lost to surgery using a unique soft scoliosis bracing. (J.Pediatric Ortho.,2007). SpineCor’s revolutionary brace is soft and flexible allowing for total freedom of movement. The brace is unique as it does not force the spine into a position. The therapeutic approach that is taken, places the patient into a Corrective Movement® through the use of strategically placed elastic bands. This corrective movement principle is based on the patient’s specific scoliosis and helps unwind the scoliosis to allow for correction by re-education of nerves and muscles. Additionally, there is relief of pain using this type of scoliosis bracing, as the body has decreased muscular strain as posture improves. For all of these reasons our office fully endorses the use of the SpineCor brace. Most children (0-16 years) diagnosed with a significant scoliosis by their family doctor are typically referred to a local orthopedic surgeon for confirmation and recommendations. The wait time to see a local orthopedic surgeon is can be more than six months. At this point recommendations will be a “wait and see” approach, bracing or a surgical consultation to the scoliosis clinic of the BC Children’s Hospital (BCCH) in Vancouver BC. During a “wait and see” approach, a patient will have a consultation and follow-up X-rays to assess progression or stabilization after approximately six months. If a child is referred to the BCCH, the first consultation visit could take another 6 months. At this point, it is determined if the patient is a candidate for bracing or surgery. If surgery is recommended, there would typically be another significant wait. The traditional medical system for scoliosis diagnosis and treatment is overwhelming and waiting can take years. Commonly, patients and/or parents are now seeking alternative approaches for scoliosis. For adults, typically a diagnosis of scoliosis is determined by their family physician or chiropractor. The most common subjective complaint is chronic back pain. Preliminary clinical trials with adults using the SpineCor scoliosis brace saw 90% of patients achieved and maintained a mean pain reduction of 70% over at least one year and that there was an average cobb angle reduction of 4.41 degrees ranging from -12 degrees to +3 degrees. If the scoliosis is severe and compromising lung and heart function, adults are referred to an orthopedic surgeon. As you continue your search for treatment options, remember there is no “quick fix” for scoliosis. Please take this information into consideration and make the best choice for you or your child. 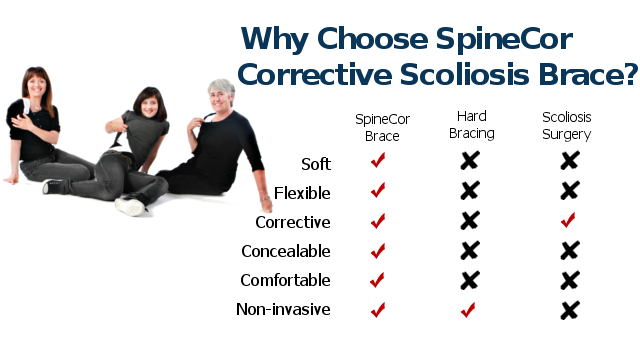 We strongly believe that taking a proactive approach like using the SpineCor scoliosis brace is a safe, non-invasive and scientifically effective choice. Call today to make an appointment at our Calgary Alberta or Kelowna BC office (403) 240-7440.